As our focus continues on engaging the 21st Century learner, it is important to consider the impact technological changes will have on the learning of educators, as well as students. The recent Premier’s Technology Council report suggests the K-12 education system “should more consistently focus on the skills required to find and use relevant content rather than on the delivery of pre-determined content.” So, if our challenge in the classroom is to work with our students so they learn the skills necessary to adapt to new content, shouldn’t the focus for our own learning stress the same? While there continues to be lots of discussion about personalizing learning to improve student engagement, we also need to focus on the engagement of educators and creating ways that educators can participate in meaningful, relevant and personalized professional development. One forum that enables educators to engage in meaningful and relevant professional development is the Edcamp model. We are excited to announce that the popular Edcamp model of professional development is coming to Vancouver. Organized by a group of teachers, school and district level administrators, Vancouver will be the first city outside of the USA to offer an Edcamp. What is Edcamp? Edcamp is organic, democratic, participant driven professional development for educators. There are no keynote presentations, there is no formal pre-set agenda, and participants set the course of the day. The Edcamp experience will be that of an un-conference. Wikipedia describes an un-conference as a facilitated, participant-driven conference centered on a theme or purpose. The term "unconference" has been applied, or self-applied, to a wide range of gatherings that try to avoid one or more aspects of a conventional conference, such as high fees and sponsored presentations. A key component of the Edcamp Vancouver un-conference experience will be the use of technology to assist attendees in learning what is happening in each of the facilitated learning opportunities that is occurring. Social media tools such as Twitter will allow attendees to monitor different groups and decide how to spend their day. Attendees are encouraged to vote with their feet- if a session isn’t meeting your needs, move to a session that will-no hard feelings! 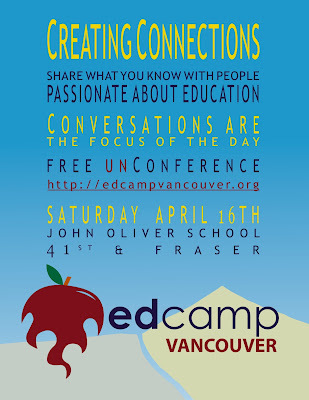 I look forward to seeing you at EdCampVancouver! Aaron, I am really hoping to make it to Vancouver for Edcamp - I think it will be awesome. I am hoping for a few tweaks to my schedule that weekend, so I can attend. Thanks for organzing and promoting it.